Will Hutchins on Little Orphan Annie's dog Sandy, Arvo Ojala and W. C. Fields. Lest we forget, many happy returns of the day to Little Orphan Annie’s best friend, Sandy. During August’s dog days Daddy Warbucks hosts a swell party at the Tailwagger’s Club in Newfoundland. Outdoors it was raining cats and dogs, and there were poodles all over the ground. Hollywood’s A-litter showed up. Daisy in her low-cut Poochie gown followed closely by Trey Donahue who hounded her all night. Toto and Asta, Benji and Fala, Rin Tin Tin and Chu Chin Chow. USC’s mascot George Tirebiter was escorted by Sandy’s favorite actress, Helen Twelvetrees. Sam the St. Bernard tended bar, and Snoopy, shell-shocked from an air battle with the Red Baron, supplied the peanuts. Wilhelm Weiner dog catered the mutt-on dinner. Spayed Cooley and pit bull band provided the music along with singers Joe Cocker and Ferlin Husky, who sleighed ‘em. Suddenly, the room darkened, a screen lowered, and the guests were treated to MGM’s latest hit, “Lassie Get Down”. UK title: “The Big Heist”. Fido Vance the police dog howled all night. His badge hurt. Everyone shouted, “Hush, puppy! You’re louder than Old Yeller!” All proceeds went to the “Get Little Orphan Annie Eye Pupils Fund”. Waldo the watch dog glanced at his watch. “Hey! It’s cur-few! Everybody flea!” Several canines fainted from the heat, so Sandy made a wish and blew out the candles. Ay, chihuahua! Sandy’s 65 (in doggie years)! “Speech! Speech! barked the gathering. Sandy jumped upon Daddy Warbucks’ wallet. “AARP!” he said. You really had to be there. East is East, West is West, and so is my wife Babs. She’s my Long Island cowgal. She loves to go to Santa Fe, or as I call it, a shopping spree in Santa Fee. Her new Mecca is New Mexico. “Show me the loot,” said I—Hmmm! Mighty impressive. My favorite objet d’art is a chalkwork cowboy from the ‘40s. Back then you had to knock down all the bottles in a penny arcade to bring him home. He looks fine, atop the TV, in a slight crouch, ready to slap leather. Maybe he’s from the Painted Desert. 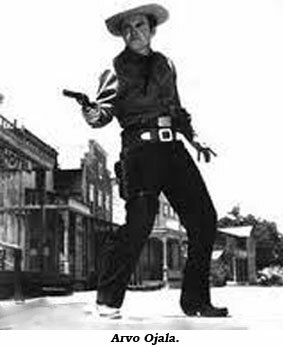 He sports dusty boots, brown shotgun chaps, two rusty guns, black gloves, white shirt, tattle-tale gray vest, silver badge, yellow neckerchief, green hat, and a purple mask. Who is that masked man? I call him The Phantom of the Horse Opera. Which reminds me, t’other day I was in our local Mom and Pop feed and seed store. Mom said to me, “Didn’t you used to be in westerns?” I modestly lowered my head in aw-shucks fashion. “Yes’m,” I allowed. Mom said, “Didn’t you used to play Tonto?” Ouch! I recollected a rhyme Babs told me. I replied. “I don’t know, and I don’t care. Tonto lost his underwear.” I got outta there fast before she could let me have it with a sack of bat guano. Before our Eastward Ho! Babs and I lived for 12 years on Waverly Drive in L.A.’s Las Feliz district. I was born on that street. The LaBiancas died on that street, murdered by the Manson gang. Nearby, the steep stairway immortalized in Laurel and Hardy’s Oscar-winning short, “The Music Box”, still scales a hillside. Yep, more than 80 years ago, but Stan and Ollie will be pushin’ that consarned piano up those blamed stairs till Kingdom come. Not far from these steep steps is L.A.’s steepest street, Fargo Street. At hill’s bottom the ol’ red pacific Electric streetcar once rolled along from downtown to North Glendale, passin’ by Edendale, erstwhile home of Mack Sennett’s Slapstick factory. Later, a roller rink occupied the property. I wonder, at night when all the skaters were gone, could you hear the echo of pratt falls? Did ghosts of Keystone Kops hover? Custard Pie in the Sky? Two blocks from Waverly Drive is the site of the original Walt Disney Studio. A supermarket stands there now, but out front a plaque honors the magic created there long ago. Kinda sweet, don’t you think? Hard by the market is the photogenic Hyperion bridge, location of many a movie action scene. 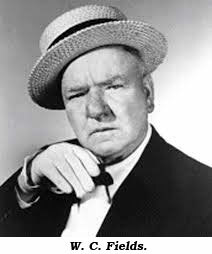 Somehow, W.C. Fields got his jalopy hitched to a fire truck there in “Never Give a Sucker An Even Break”. Fields lived in a house on De Mille Drive, ‘bout two miles from the bridge. Lily Tomlin lives there now. Every Sunday W.C. hosted brunch for his buddies. Gerald Mohr was a regular. That’s right. I worked with Mohr on two “Sugarfeet”. On screen he was suavely sinister. ‘Twixt takes, laffin’ and jawin’ in his canvas-backed chair, he was an affable gent, his eyes somewhat faraway. His tragedy was that he wasn’t born Humphrey Bogart. Loved his W.C. Fields recollections. Some actually fit for a family publication. Here’s one. Fields was one of the world’s greatest jugglers. He’d demonstrate his prowess at those Sunday gatherings. At the head of a long table W.C. stood in charge of the waffle iron. His guests sat poised, appetites whetted. When a waffle emerged from the iron, fully concocted onto the great man’s spatula, he’d summon one of his cronies to hold out his plate. In one smooth movement, W.C. would flip said steaming, non-skid waffle through the air to its appointed target, smack dab in the middle of the outstretched plate. Thus, he fed his Sunday pals, and he never missed. Our country is so full of wonder you really don’t have to travel abroad. You can’t possibly behold all the miracles of America in a lifetime. So stay home during these perilous times. Save on gas money, slip a DVD into your TV, sit back with a beverage of your choice, and glory in God’s gifts.